“Green” is a global movement to promote sustainable practices in all walks of life, from recycling waste to reducing one’s dependence on materials that cannot be reused, as well as improving automobile fuel economy, minimizing energy consumption (reducing one’s ‘carbon footprint’), and promoting safer, cleaner means of producing energy, primarily by the use of renewable sources such as wind and solar power. It also means promoting and using sustainable practices in agriculture, whether in the raising of farm animals and produce, or in viticulture (the growing of table and wine grapes)—itself a type of agriculture. Green—a synonym for “sustainable”—is now a mantra for the ecologically-aware and sensitive consumer and it demands to be taken seriously by those who produce food, wine, and care for the land on which it is raised. A big push towards sustainable practices in viticulture in New York State recently has been made by Walmart, which joined the Sustainability Consortium in 2009, and wants to sell grape juice with an “ecolabel” displayed on the containers, showing that it has been sustainably produced. Given that Walmart is the world’s largest retailer, its demand has forced winegrowers throughout the state, whether producing juice grapes or wine grapes, to respond to it. 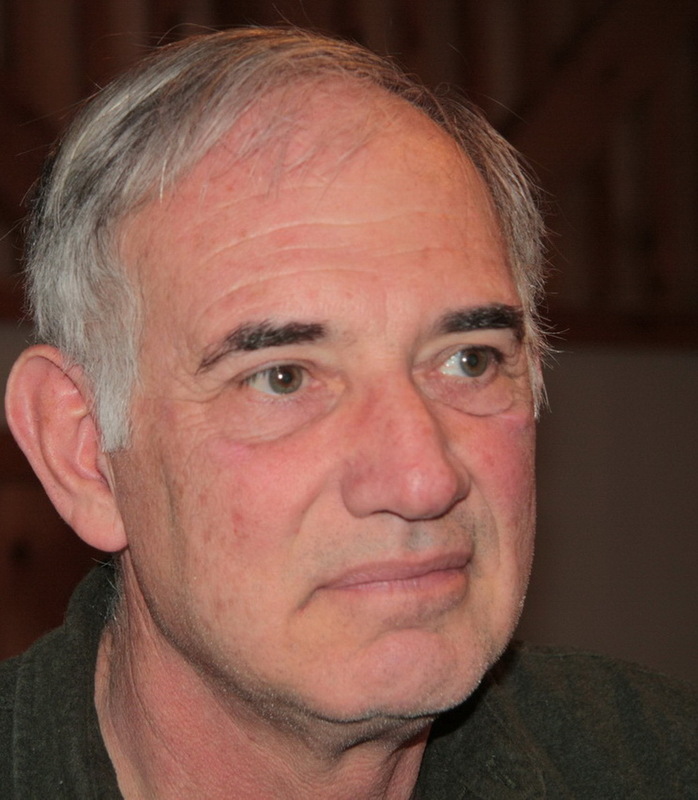 What follows is about the response to the challenge on the part of Long Island winegrowers. In a presentation by Barbara Shinn, of Shinn Estate Vineyards, and Richard Olsen-Harbich, of Bedell Cellars, given at the 31st Annual Long Island Agricultural Forum, held on January 13, 2012, attended by most of the vineyard managers in the region—all were invited to attend—an outline of the process by which vineyards could become certified for practicing sustainable viticulture gave clear form to what is involved in achieving that goal, with the objective of minimizing environmental impact and as a means of responding to the needs of the community at large. 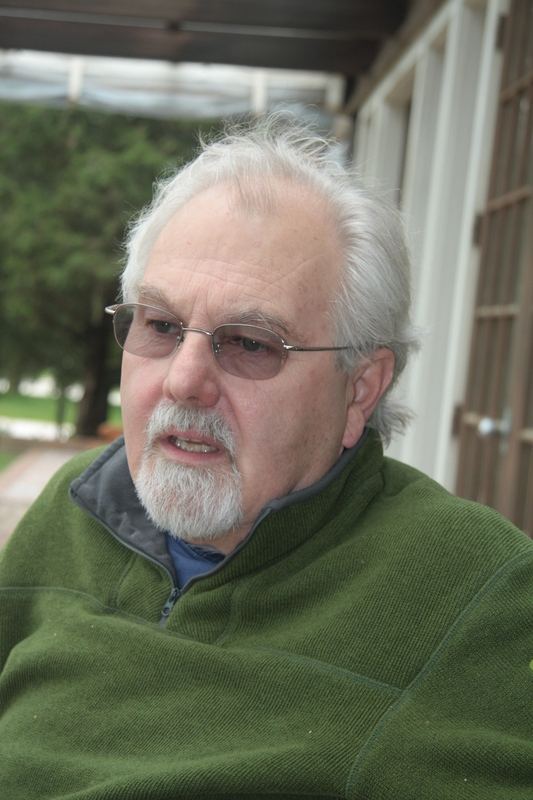 “In 1992, I received a grant to create a Long Island sustainable viticulture program. Working with a group of growers, we created a set of vineyard management guidelines that emphasized good stewardship practices. Established programs such as Oregon LIVE, Lodi Rules, and AEM (Agricultural Environmental Management) were very helpful to us. A number of individuals associated with those programs provided guidance as well. Our efforts drew attention from both upstate wine growers and the upstate Concord industry. Starting in 2006, a group from Cornell and from the industry received a series of grants to create statewide guidelines, now called VineBalance. “Growers participated in the process of creating the guidelines so additional review has not been necessary. That said, VineBalance was written to be inclusive of all grape industries in NY. There are certain things in it that do not apply to Long Island. Also, vineyard management is not a static thing, it evolves each season as we learn how to best manage our vineyards. Consequently, Long Island growers decided to further refine VineBalance to more closely reflect the current management of Long Island vineyards. 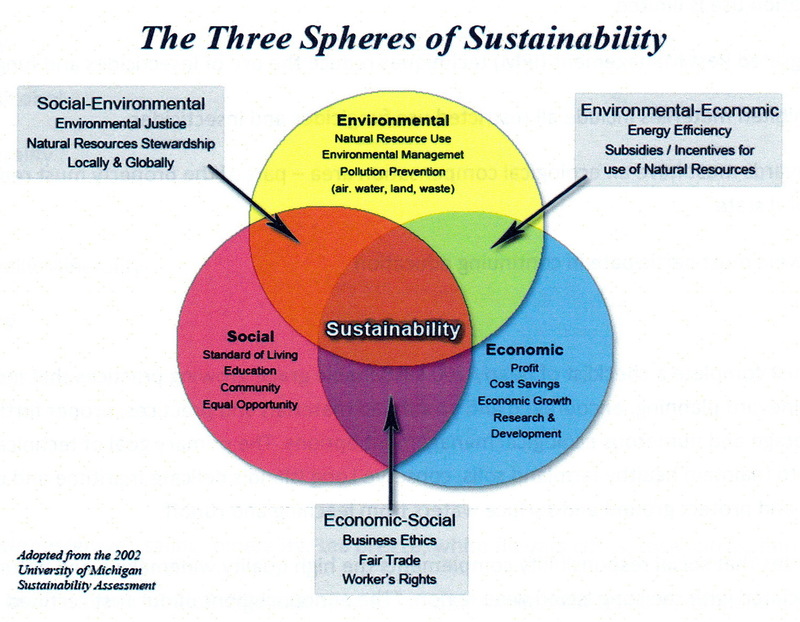 Each of these, as well as the internationally-recognized authority, Sustainable Wine New Zealand (SWNZ), is directed at specific ecological systems, which is why Long Island needs its own authority, but these at least provide models for the project to be known as Long Island Sustainable Winegrowers (LISW). 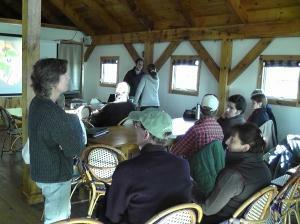 In December of 2011, Chris Serra, of Oregon’s LIVE certification program, was invited to give a presentation to the East End vineyard managers. The expenses for his trip were paid for by Martha Clara, Bedell, Shinn Estate, and Channing Daughters, the four vineyards whose managers form the Core Group. 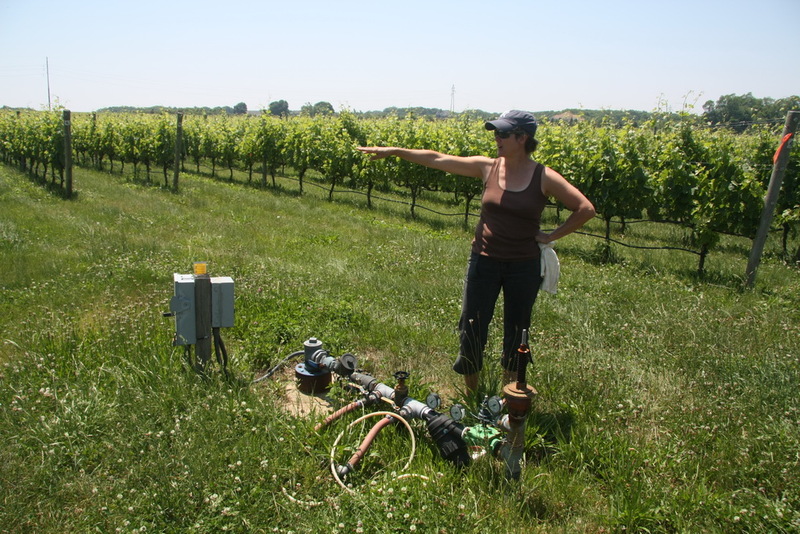 Whatever certification authority Long Island wine growers create must have credibility and address not only agricultural standards of sustainability but must also deal with ethical issues; for example, a certifier representative must not be involved with the vineyards being visited in the capacity of consultant or have any other ties to them. Winegrower’s Pledge that is signed in the spring prior to the growing season. Members get a visit from a certifier representative in the first and second years of the track to certification and every third year thereafter. There are real potential benefits that come with sustainability and certification, and Long Island’s third-party certification will be carefully watched by wineries elsewhere in the Eastern United States, including Virginia, South Carolina, and New Jersey. What LISW does will certainly influence them in the development of certification authorities for their regions. Copper sulfate is also a widely-used industrial product that is used in agriculture primarily as a fungicide. “Farming practices, as mentioned above, such that they should not have a negative effect on the community at large; choice of sustainable inputs is an important part of this. Trent Pressler, CEO of Bedell Cellars, addressing the LISW audience. For wineries that are certified, the LISW logo can be included on the wine labels, thus showing that the wines are made from grapes raised with a conscience. 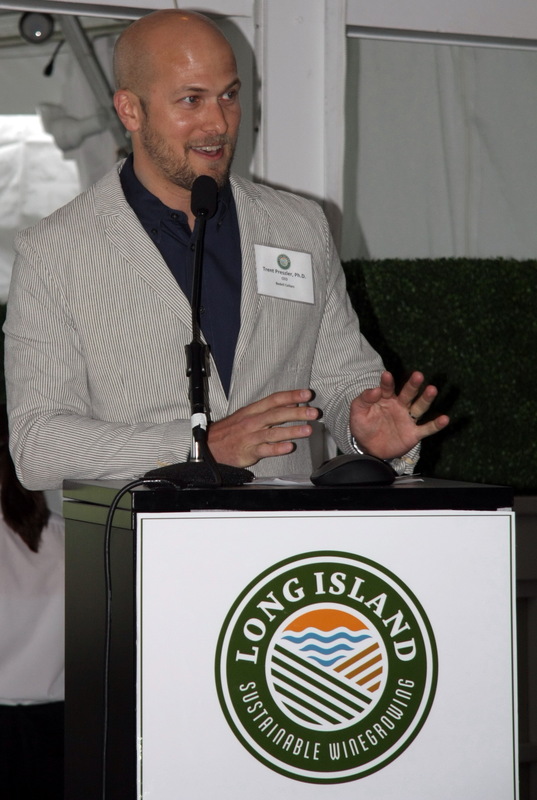 This, it is hoped, will also help promote Long Island wines among those consumers who care about this, and the number who do are steadily growing. 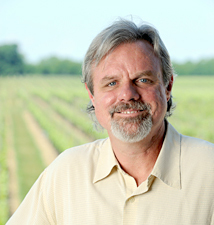 Certification is accomplished by the expertise of LISW’s independent third-party inspector: Allan Connell, the former District Conservationist for the U.S. Department of Agriculture’s Natural Resource Conservation Service (NRCS), using the New York VineBalance Grower Workbook as a roadmap for evaluation of the sustainable viticultural practices of Long Island vineyards. More information about sustainable farming is available upon request from LISW at lisustainablewine.org, facebook.com/sustainablewinegrowing, and twitter.com/liswinegrowing. Further to that, a February 6, 2016 NY Times article, “Cover Crops: A Farming Revolution with Roots in the Past” finds that all kinds of agriculturalists all over the country are finding out that cover crops are good for their crops! For example, Oregon LIVE (Low Input Viticulture and Enology), which was established as a sustainable viticulture certification program in 1997, has about an 80% participation rate. E-mail from Barbara Shinn, 1 March 2012. Correspondence by e-mail with Alice Wise was from January 29 to February 7, 2012. This entry was posted in Vineyards, Viticulture, Wineries and tagged Alice Wise, Barbara Shinn, Bedell Cellars, Biodynamic Viticulture, CCSW, Channing Daughters Winery, Chris Serra, Cornell Cooperative Extension of Suffolk County, Cover crops, Duckwalk Vineyards, Ecolabel, I.P.M., Integrated Pest Management, IPM, Jim Thompson, Larry Perrine, Lodi Rules, Long Island Horticultural Research & Extension Center, Long Island Sustainable Winegrowers, Long Island Vineyards, Low-impact input, Martha Clara Vineyards, N.O.P., Napa Green—Napa Valley Vineyards, National Organic Program, NOP, Oregon Certified Sustainable Wine, Oregon LIVE, Organic Certification, Organic Viticulture, Paumanok Vineyards, Peconic Land Trust, Pindar Vineyards, Richard Olsen-Harbich, Shinn Estate, Sparkling Pointe, Sustainability Certification, Sustainability in Practice, Sustainable Viticulture, Sustainable Wine New Zealand, Sustainable Winegrowing, SWNZ, Synthetic Nitrogen, Trent Pressler, VineBalance, Vineyard scouting on 17 March 2014 by JoseM-L.